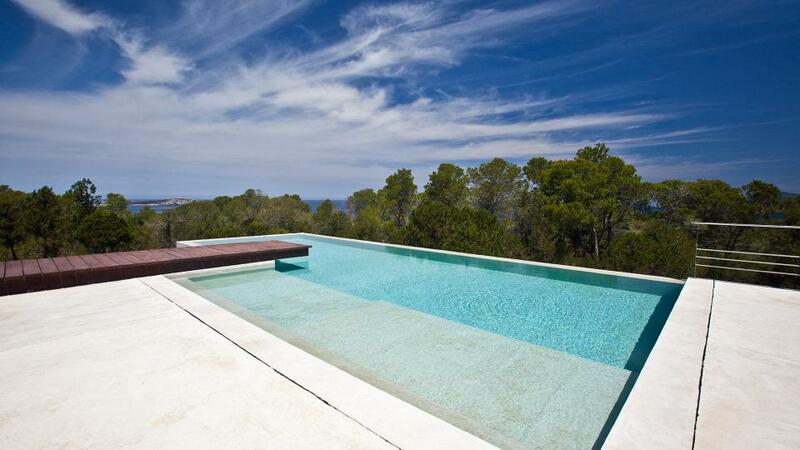 With a plot of over 20,000 m2, this magnificent property is ideally located in the San Rafael area, just 10 minutes drive from Ibiza town. Access by a path half land half concrete of more than one Km. 4X4 advised but not obligatory. 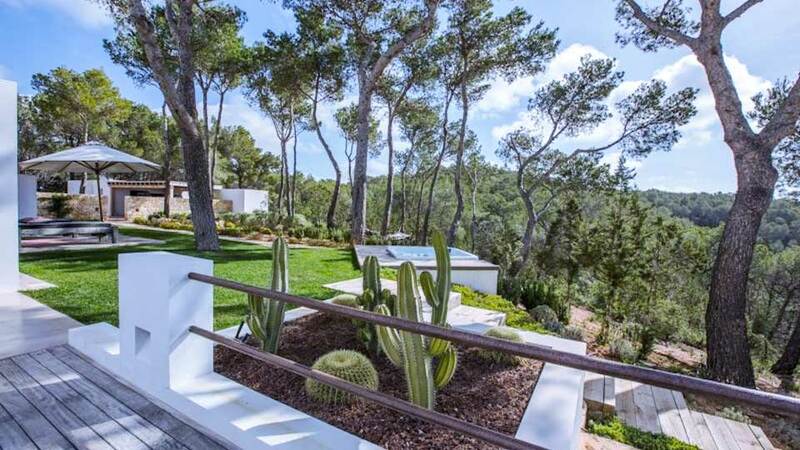 Located on the top of a mountain, the house offers 400m² of living space and beautiful gardens. 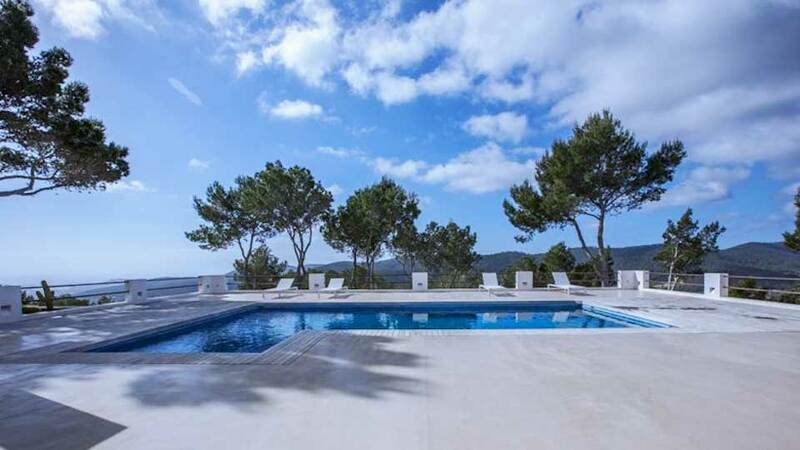 Thanks to its convenient location close to the city of Ibiza, this villa is perfect for those looking to enjoy all that the city has to offer, while enjoying absolute tranquility and all the comforts of a private villa . Suite, Ground level. This bedroom has 1 double bed. Bathroom ensuite, With bathtub, shower. This bedroom includes also air conditioning, dressing room, private terrace. Room, Ground level. This bedroom has 1 double bed. Bathroom ensuite, With shower. This bedroom includes also private terrace. Room, Lower floor. This bedroom has 1 double bed. Bathroom ensuite, With shower. This bedroom includes also private terrace. Room, Lower floor. This bedroom has 2 twin beds. Bathroom ensuite, With shower. This bedroom includes also private terrace. Double living room with fireplace and equipped with international satellite TV, DVD player, Home cinema, Ipod docking station. Air conditioning. Dining room for 14 people with direct access to the terraces. From the kitchen, direct access to a large terrace converted into an outdoor lounge covered by a large sail, a bar area, a table for 14 people and a corner "plancha". 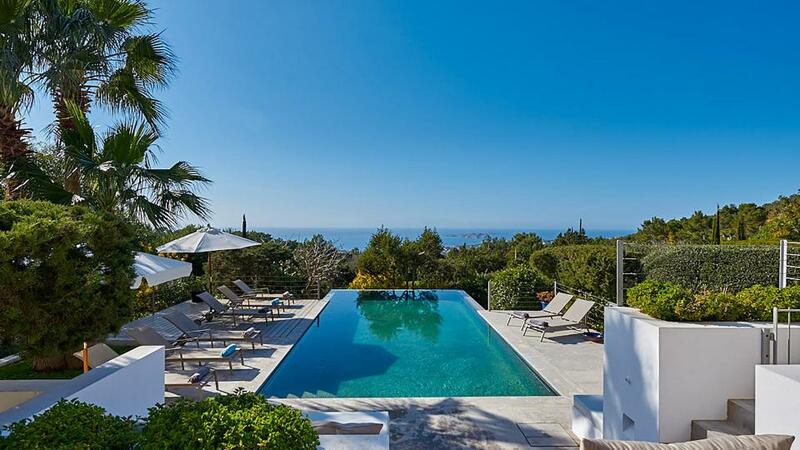 Great view of the whole valley and in the sea, the sea and the west coast of the island. Double access by exterior stairs to the lower floor. 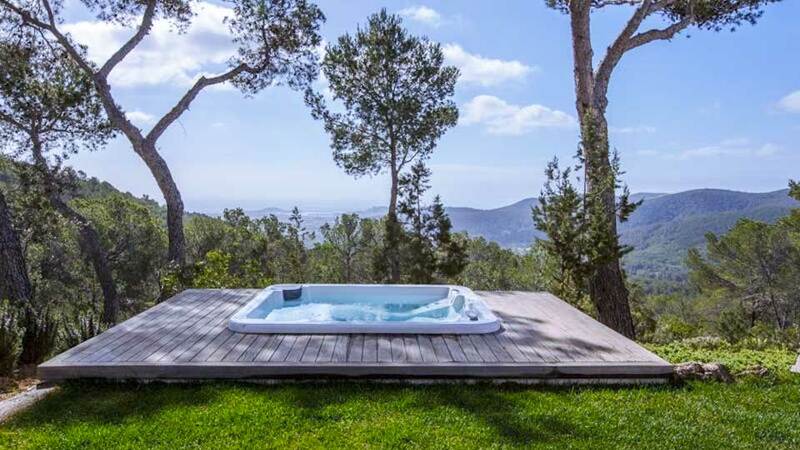 Private pool 11 x 5 m.
Jacuzzi with superb views of the bay of Ibiza's old town, the sea and Formentera. Mediterranean garden very neat with beautiful lawns. 3 living rooms and an outdoor dining room. Parking for more than 6 vehicles (not covered). Talamanca Beach and its famous restaurants are a 10-minute drive away. 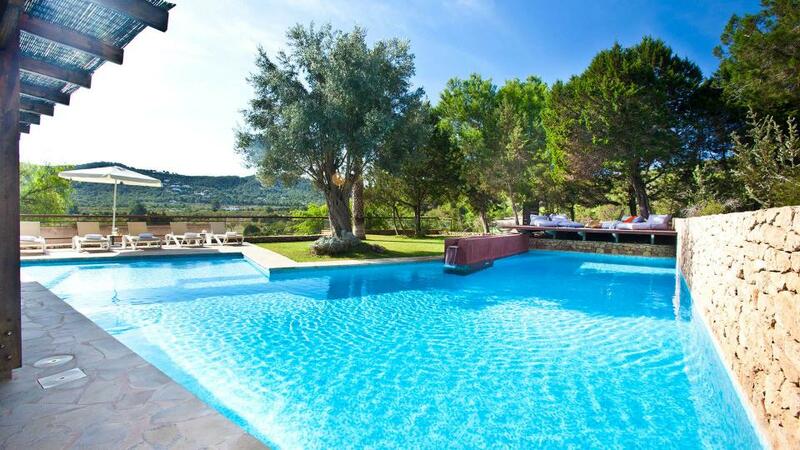 The other beaches in the northeast, as well as the famous beaches of Salinas and Es Cavallet are within 15 minutes. 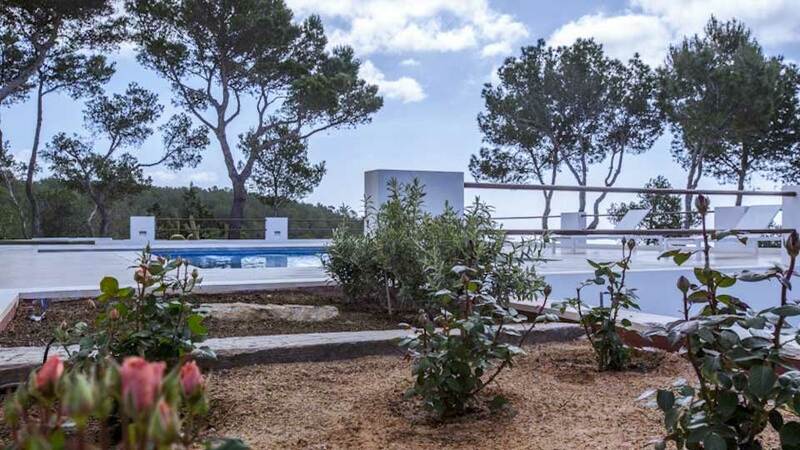 All the beaches of the west coast like Cala Conta, Cala Bassa, Cala Tarida, Cala Salada ... are 15-20 minutes by car.